Researchers at the RIKEN Center for Sustainable Resource Science (CSRS) in Japan have discovered a small hormone that helps plants retain water when none is available in the soil. Published in the journal Nature on April 4, the study shows how the peptide CLE25 moves from the roots to the leaves when water is scarce and helps prevent water loss by closing pores in the leaf surface. In animals, peptide hormones are small chains of amino acids that move through the blood and help keep our bodies in balance when the environment changes. For example, when your blood pressure is low, your body produces the hormone vasopressin, which circulates in the blood and acts to narrow your arteries, which increases your blood pressure back to normal levels. Plants also have hormones–called phytohormones–but, scientists know much less about them. 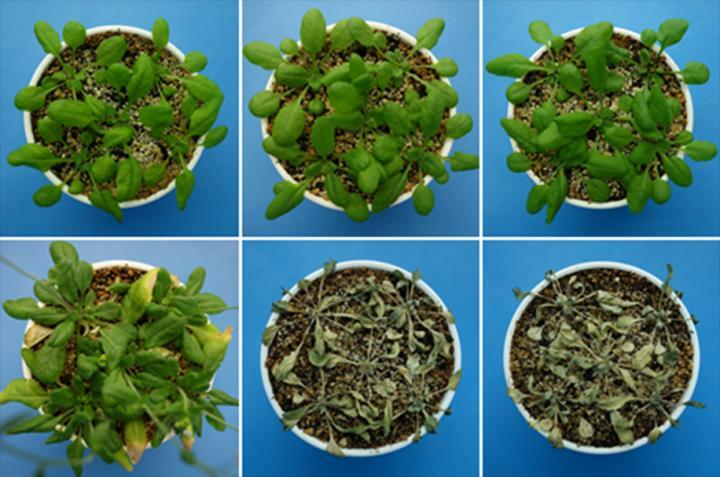 The plant scientists at RIKEN CSRS wanted to find out whether any plant hormones respond to physical–abiotic–stress. As first author Fuminori Takahashi explains, "Although we know that some peptide hormones in plants mediate cellular development, until now nobody had identified any that regulate responses to physical stresses such as dehydration." The team began by looking at CLE peptides that are synthesized in the roots and at ABA– a hormone that is known to accumulate in leaves and help close pores in response to drought stress. Applying many CLE peptides to plant roots showed that only CLE25 led to increased ABA in the leaves and pore closure. The team determined that the link between these two events was the increase in an enzyme necessary for making ABA. In addition to this artificial situation, they showed that CLE25 levels increase in the roots of plants that are subjected to dehydration stress, leading to the same results. The next question was whether CLE25 moves through the plant circulatory system. Detecting functional peptide hormones is very difficult in living cells because the amounts are so small. "We resolved this problem," says Takahashi, "by using a high sensitive mass spectrometry system, and developing a screening system that can identify the mobile peptides moving from root to shoot." With this technology, the researchers were able to tag CLE25 molecules and visualize their movement from the roots to the leaves, indicating that it was indeed a mobile hormone and that it likely interacted with other molecules in leaves to produce ABA. Before investigating how CLE25 induces ABA synthesis once it arrives at the leaf, the team created mutant plants that lacked CLE25 or ABA and performed several control experiments that confirmed their findings. In particular, after only three hours of dehydration, plants without CLE25 already showed 7 times less leaf ABA and had lost more water than control plants. Finally, the team examined several mutants and discovered that BAM1/BAM3 receptors in the leaf were the link between CLE25 and ABA production. Now that they have discovered the CLE25 peptide hormone and determined how it helps plants retain water, the team is confident that this is just the beginning. As Takahashi notes, "Our research absolutely has applications in the real world and should contribute to the development of abiotic stress-resistant crops that take advantage of the mobile peptide system in plants." The group at RIKEN CSRS already has its own plans in this direction. "First," explains Takahashi, "we are working on modified peptides that are more effective for stress resistance than the natural ones. Second, we are working on ways to mix functional peptides into fertilizer to enhance drought resistance of crops in the field." Reference: Takahashi F (2018) A small peptide modulates stomatal control via abscisic acid in long distance signalling. Nature. doi: 10.1038/s41586-018-0009-2.